Anodising is an electrochemical process for producing controlled and thicker aluminium oxide films on aluminium and aluminium alloys. The anodic film is formed by converting the surface of the part into aluminium oxide. The resulting finish forms an integral bond with the base material. Depending on the process, this finish is the second hardest substance known to man, second only to diamond. 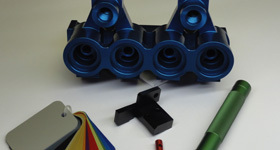 Aluminium parts can be anodised clear, or for a more decorative appearance that maintains all of the benefits of anodising, your parts can be dyed during the anodising process to produce various coloured finishes. 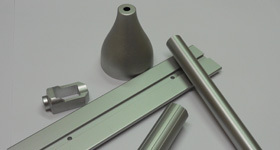 Hard anodising is performed where maximum hardness, wear and corrosion resistance is required. The hardness characteristics produced during this process are second only to diamonds. 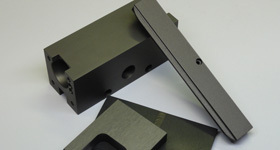 Hard anodised finishes are typically darker in appearance than standard natural anodised finishes due to the thicker oxide that is produced. A variety of colours are available, including black. Due to the varying chemical composition of aluminium alloys, we highly recommend that you consult with us on alloy selection for best anodising results. Chromate conversion coatings use chromic acid in the form of its soluble salts to produce an aluminium oxide and chromic oxide layer. The resultant gel-like film that is produced hardens leaving a finish ranging in shade from a light yellow to gold depending upon your specific requirements. Collins Anodic Treatment (Vic) Pty Ltd also provides an environmentally safe, chrome-free protective conversion treatment for aluminium alloys. 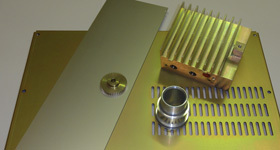 Chrome-free passivation was developed in response to the ELV, RoHS and WEEE directives, and as a result does not contain Lead, Cadium, Chromium (hexavalent or trivalent), Mercury or PBB/PBDE compounds. The finished coating is almost clear, but can have a slight bluish tint. All Collins Anodic Treatment (Vic) Pty Ltd anodising and chemical conversion treatments are done in accordance with Military specifications and Australian standards, as well as individual requirements. Collins Anodic Treatment (Vic) Pty Ltd offers a quick turnaround service. When production time is pressured by external factors we can accommodate your schedule demands with our 24 Hour and 48 Hour services.